Back towards the end of May we started to monitor the Norwegian Krone (Time to look at a Scandie). A little later we invoked the Madelbrot algorithmic routine with the USDNOK pair as the subject. 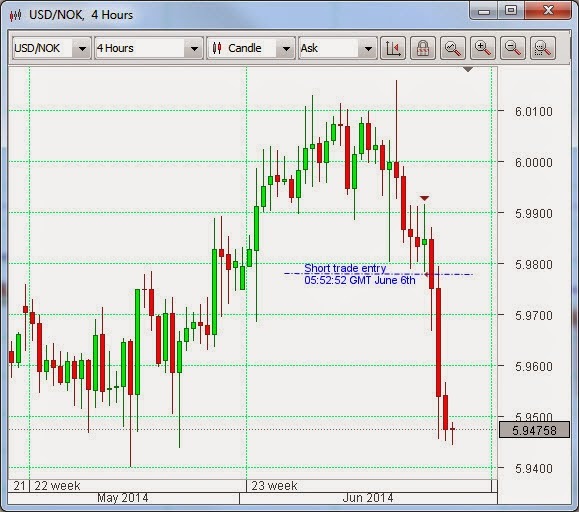 We configured it to look for short trades because we believed that the Krone could appreciate, based on Technical Analysis (USDNOK going down means that the NOK side of the pair (quote currency) is strengthening relative to the other side (base currency)). Nothing happened for about four days. That is not a problem when you have an algorithmic routine monitoring the situation, although we did take a look in at it from time to time. Then, on last Friday morning, early, a trade was triggered (see chart above) by the routine. 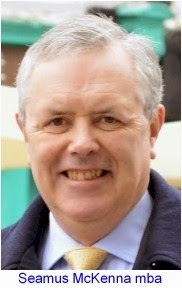 During the day it grew steadily in profit. The US dollar ICE index, the largest component of which, by a long way, is the Euro, looked as if it might be turning down in the aftermath of the ECB decision to reduce rates on the previous day. This had, somewhat perversely, led to a strengthening of the Single Currency against the US unit. But that could not have been the whole story. As noted previously, Norway is an important oil producer, and the value of the Krone has been influenced by the price of oil in the past. But now all indications are that oil is in for a decline. The reasons for this have to do with increased production of oil and gas due to the greater use of fracking, particularly in the USA; the ending of the unusual cold spell that gripped a great part of the US in the Winter just past – temporary demand for heating oil masked a permanent increase in production for a while (refineries are producing more so the price of crude is falling); the clearance of a blockage to delivery out of the main storage facility in Cushing, Oklahoma; and the fact that people are driving a lot less than they used to. It is also possible that oil producing regions of the world that have been subject to sanctions up to now (Iran comes to mind) will be allowed to once again enter the global market at some time in the not-too-distant future. So whatever caused it, the strengthening of the Krone could not have been as a result of the prospects for the price of oil. 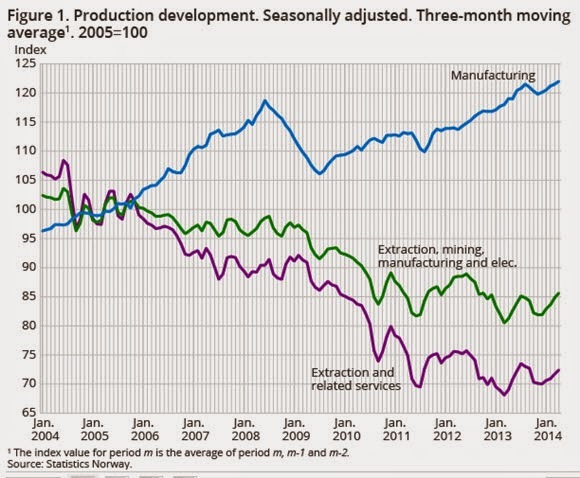 It was, in fact, the release, by statistics Norway, of the index for industrial production for April. Significantly, the headline on the report said: “Record-high manufacturing output”. The graph above tells Norway’s story in recent times. It appears that the country has managed to bring its manufacturing and associated exports up to a level that more than compensate for a decline in the importance of oil and gas production and services to its economy, and the out-turn in the most recent report has served to confirm this tendency. The Forex market just might be in the process of rewarding the currency accordingly.